George W. is well known for visits to his hometown ranch in Crawford and Obama for his visits to his home state of Hawaii. As a youth, President Obama excelled at the esteemed Punahou Academy and graduated with academic honors in 1979. Born in Honolulu in 1961 and raised minutes from Waikiki a young Barack Obama developed a love for his home state’s beaches, namely body surfing at Sandy Beach, plate lunches at Zippy’s and the Hawaiian Snow Cone affectionately known as “shave ice”. 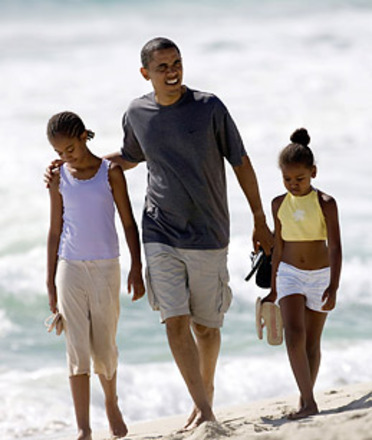 For President Obama, Hawaii will always be home and over the recent holiday break, he and his family joined the ranks of the over 7 million who choose to vacation amongst the Hawaiian islands each year. Regardless of how you vote in 2012, both Red and Blue staters can agree from its natural beauty to its plentiful family activities that island hopping in The Aloha State can be a prime family getaway. George W. is well known for visits to his hometown ranch in Crawford and Obama for his visits to his home state of Hawaii. As a youth, President Obama excelled at the esteemed Punahou Academy and graduated with academic honors in 1979. Born in Honolulu in 1961 and raised minutes from Waikiki a young Barack Obama developed a love for his home state's beaches, namely body surfing at Sandy Beach, plate lunches at Zippy's and the Hawaiian Snow Cone affectionately known as “shave ice”. For President Obama, Hawaii will always be home and over the recent holiday break, he and his family joined the ranks of the over 7 million who choose to vacation amongst the Hawaiian islands each year. Regardless of how you vote in 2012, both Red and Blue staters can agree from its natural beauty to its plentiful family activities that island hopping in The Aloha State can be a prime family getaway. When thinking of Hawaii, you immediately conjure up visions of palm trees, beautiful white sand beaches, and scenic waterfalls that make our 50th state a natural theme park that can be both a relaxing and an invigorating experience for everyone. Like many of the Hawaiian Islands, Kauai is the top of an enormous volcano rising from the ocean floor. Over the course of millions of years volcanic eruptions and the steady erosion from the waters of the Waimea River formed perhaps the greatest geological wonder of the islands, Waimea Canyon. Affectionately known as “The Grand Canyon of the Pacific” this mile-wide and 3,600 foot deep canyon stretches 14 miles along the western side of Kauai. The aptly named Waimea Canyon Drive, leads motorists to the main canyon overlook, offering panoramic views of Kauai's dramatic interior. From there a tour continues into the Kokee State Park and its plentiful hiking trails where many, including Cliff Canyon and the Black Pipe Trail, are suitable for a family hike. Thirty miles from the main airport lies a tiny little town on the far eastern edge of Maui called Hana. Amongst the last of Hawaii's unspoiled frontiers, it can take as long as four hours to drive there via the seemingly endless curves through the rain forests that make up the Hana Highway. Vacationers looking to revel in the journey, that includes 620 curves and 59 bridges, as much as the destination will be in heaven traversing the fifty plus scenic miles. There are few if any places on earth where you can see stunning waterfalls and coastal sights right from your car. Hana Waterfall is one of the many that you will see along your drive, while others beckon with just a short hike from the beaten path. Once on foot you may opt for a local to help you make your way to Red Sand Beach, a secluded cove that gets it's namesake coloring from the erosion of iron-rich volcanic lava rocks from the nearby mountains. Also stretching across the Maui coastline is Haleakala National Park home to Maui's highest peak. Rising 10,023 feet above sea level, Haleakala has a bird’s eye view of the entire island. The park is comprised of over 30,000 acres of public land, has three separate visitors centers, and covers a range of natural environments. You can travel atop the highest peaks of Haleakala, hiking above the clouds and horseback riding across otherworldly deserts. As the park stretches out to the coast towards sea level you can even visit lush tropical areas full of waterfalls and streams. Many visitors and locals wake up early to drive up to the Haleakala Visitor Center (9,740 feet), the best spot to watch the sunrise. On a clear morning, seeing the sunrise from the summit of Haleakala is an unforgettable experience. Even those who’ve witnessed the event many times say they’ve never seen the same sunrise twice. Perhaps just as spectacular are Haleakala's sunsets and the bright, starry skies revealed at night. Haleakala means "house of the sun" in Hawaiian. Also stretching across the Maui coastline is Haleakala National Park home to Maui's highest peak. Rising 10,023 feet above sea level, Haleakala has a bird's eye view of the entire island. The park is comprised of over 30,000 acres of public land, has three separate visitors centers, and covers a range of natural environments. You can travel atop the highest peaks of Haleakala, hiking above the clouds and horseback riding across otherworldly deserts. As the park stretches out to the coast towards sea level you can even visit lush tropical areas full of waterfalls and streams. Many visitors and locals wake up early to drive up to the Haleakala Visitor Center (9,740 feet), the best spot to watch the sunrise. On a clear morning, seeing the sunrise from the summit of Haleakala is an unforgettable experience. Even those who've witnessed the event many times say they've never seen the same sunrise twice. Perhaps just as spectacular are Haleakala's sunsets and the bright, starry skies revealed at night. Haleakala means "house of the sun" in Hawaiian. At just under 11,000 square miles Hawaii is the 43rd smallest state in the union, but ranks just behind Alaska, Florida and California with approximately 750 miles of beaches throughout its eight major islands. Found in just about every color imaginable from Maui's pristine white to Kauai's volcanic black and red sands the beaches of Hawaii are a sight to behold. Add to this winter high temperatures in the low 80s and you have the perfect place to enjoy all the sandy shores have to offer. The shores off the northwest tip of Maui have three miles of white sand and crystal clear water known as Kaanapali Beach. The first of Hawaii's many planned resort areas, Kaanapali Beach fronts many resorts, hotels and luxury condominium villages and the renowned shopping and dining of Whalers Village. Despite the plentiful commercial attractions, Kaanapali Beach is most famous for its daily cliff diving ceremony. Honoring a feat by Maui's revered King Kahekili, every evening at sunset a single cliff diver lights his torches along the cliffs at Puu Kekaa, or Black Rock, before making the signature plunge. Once named America's Best Beach by the Travel Channel, Poipu Beach on Kauai's South Shore has some of the most inviting waters to both visitors and marine life. Spring Breakers and anyone traveling between December through May will more than likely spot humpback whales spouting off its shores. Also calling the beach home are honu (Hawaiian green sea turtles) but Poipu Beach is most famous for the endangered 600 pound monk seals who enjoy sunbathing there just as much as anyone else. On the south shore of Honolulu, the world famous beach neighborhoods surrounding Waikiki were once the playground for Hawaiian royalty. With the iconic silhouette of Diamond Head as its backdrop, the waters of Waikiki are the perfect place for kayaking or a family surfing lesson. Legendary Hawaiian waterman and Olympic gold medalist Duke Kahanamoku grew up riding the waves of Waikiki and even taught visitors his craft. To this day he is known by many as, “The father of modern surfing,” and a statue in his honor has become a lasting symbol of the area. For those looking to get away from it all, the island of Lanai offers 18 miles of shoreline with a handful of secluded white sand beaches to share with your significant other. Headlining Lanai's intimate settings is Hulopoe Bay the island's major boating harbor. In the bay lies the beauty of Sweetheart Rock a natural landmark steeped in romantic lore of a Hawaiian warrior and his lover. The landmark is but a short hike from the Four Season Resort Lanai at Manele Bay. While on vacation you may feel like you are living like a king, but while in Hawaii the only official state residence of royalty is Downtown Honolulu's Iolani Palace. Influenced by European architectural styles and richly decorated this royal palace was the official residence of the Hawaiian Kingdom's last two monarchs from 1882-1893. Rightly so, the palace was actually the first residence of the islands to make use of electric lights, flush toilets and in house telephones, however visitors will be more impressed viewing the Palace Galleries that showcase royal crowns, diplomatic orders and lavish personal jewelry of the royal family. After visiting the palace, many will enjoy crossing the street to appreciate the three distinct galleries of the Hawaii State Art Museum, which showcases the ethnic and cultural traditions of the islands. For many December 7, 1941 was a day that will live in infamy and for the last 70 years visitors have returned to Oahu's Pearl Harbor and the USS Arizona Memorial to honor the final resting place for the 1,177 crewmembers killed in service after attacks by Japanese Naval Forces. After a boat shuttle visitors literally come to face to face with history, watch a film about the attack and get to pay their respects amongst memorial plaques honoring the brave soldiers who fought that day. Joined in “Battleship Row” by the memorials for both the USS Oklahoma and the Battleship Missouri (where General Macarthur accepted the Japanese surrender that ended WWII) a visit to Pearl Harbor is a patriotic trip back to a defining period in US history. Hawaiians love to eat therefore; an equally diverse menu has evolved to match the island's diversity in culture. Just like their art their palates have been influenced by generations of immigrants from around the globe yet the seclusion of the islands also affords an entire farm to table agricultural process that in many ways is exclusive to Hawaii. Perhaps the most diverse yet omnipotent fare, “Pupu”, starts off most island restaurant experiences. The Hawaiian equivalent of the appetizer, pupu may include a wide variety of chicken and beef skewers, tempura vegetables, shrimp and poke (cubed and seasoned raw fish). Just as varied is the Plate Lunch, found at local restaurants throughout the state; it generally consists of two scoops of rice, macaroni salad and anything and everything from Korean barbecue to mahi-mahi all served up on a paper plate. And when it comes to cooling off, many opt for the sweet treat known as Shave Ice. Not to be confused with a snow cone, shave ice traces back to the Japanese culture where blocks of ice were specially shaved to a fine texture to better absorb flavored syrups or fresh local fruit juices from guavas and pineapples. From world-class resorts, spas and amazing golf courses to exploring the many wonders of nature a trip to Hawaii packs a punch that will keep every member of the family excited from start to finish (or “aloha to aloha”). For families on vacation from December through early May taking part in a Whale Watch is a definite must. Each year scores of humpback whales migrate from the Gulf of Alaska to the warmer waters of Hawaii. As many as 8,000 whales travel close to 3,000 miles for a milder climate in which to breed and give birth to their young. Hawaiian's have a great respect for the whales, which they call “kohola” and therefore local regulations keep boats from approaching within 100 yards. Weighing as much as 45 tons, watching a humpback whale breach the ocean's surface is undoubtedly an exciting moment and the best vantage points are aboard a professional charter from whichever island you choose. Of course, a trip to Hawaii is not complete without enjoying a whale watch but marine lovers should also plan a visit to the Maui Ocean Center. Affectionately known as Hawaii's Aquarium, the Maui Ocean Center has the largest collection of live coral displays in the nation. Each year close to a half million visitors enjoy first hand views of green sea turtles, sharks and rays while learning about the unique marine habitats of Hawaii. In a state filled with awe-inspiring hikes and scenic drives, the best view very well may be from beneath sea level during a walk through the center's 750,000 gallon Open Ocean Exhibit. Teeming with over 2,000 species of native fishes the exhibit will give the entire family an experience of a lifetime. Just like the humpbacks, many a golfer has been known to migrate to Hawaii for its mild temperatures, and also to spawn a few rounds amongst the more than 70 championship caliber Golf Courses spread across the islands. Seasoned golfers will enjoy the challenge of playing courses designed by some of the world's best while even novice players and those new to the game can enjoy the sights and take in a lesson or two. With Hawaii's relaxed atmosphere and beautiful surroundings, this family trip could be just the time to introduce the game to your children. The island of Oahu alone is home to over 40 golf courses, more than half of those in all of Hawaii. While there are only nine courses on Kauai, the island does boasts two of Hawaii's best, both designed by Robert Trent Jones Jr. Home of the PGA Grand Slam of Golf for over a decade (1994 - 2006) Poipu Bay is a challenging links-style design. At 6,959-yard, this course features rolling greens and water hazards on eight of the holes. Make sure to take a moment to enjoy the par-4 16th set amongst coastline along the entire left side. Also in Kauai, Princeville Golf Club has 45 of the best tropical holes of golf in the world, let alone Hawaii. With vistas that include waterfalls, jungles and mountain peaks the 18-hole Prince course provides a round of golf few ever forget. Not to be outdone, Maui has some notable courses of its own. According to many professionals, the Jack Nicklaus designed Challenge at Manele is 7,039 yards of breathtaking golf high above the crashing surf of Hulopoe Bay. If Nicklaus' signature touches weren't enough the course features not one but three cliff holes which make considerable use of the Pacific Ocean as its very own water hazards. Possibly the best known of them all, due to the PGA's season opening Huyndai Tournament of Champions each January, Kapalua Resort and its Bay Course are vintage Arnold Palmer designs. When considering all there is to do while on vacation in Hawaii families who want it all opt for the best resorts with the most polished and convenient amenities. Access to posh spas, well equipped fitness centers, restaurants and close proximity to a wide variety of daytime family activities puts most resorts like Disney's Aulani and The Sheraton Maui at the top of the list. Recently celebrating it's grand opening this past August Aulani, a Disney Resort & Spa, Ko Olina, Hawaii is located on 21 oceanfront acres on Oahu. If anyone knows how to cater to families its Disney, and they have worked together with the locals to create a resort that also embraces the Hawaiian culture. Lush gardens lead to the resort's white sand beach all within walking distance from the resort's 359 rooms, 16 suites and 481 Vacation Club Villas. Thousands of gallons of pools and waterslides include the Waikolohe Stream, a 321,000-gallon waterway consisting of both a “lazy river” and tubing slides depending on which path you choose. Guests at Aulani can also take advantage of hundreds of activities suited for just about every age range. Mom can enjoy a traditional Hawaiian massage known as Lomilomi from the Laniwai Spa, and Dad can take in a round of golf at anyone of the nearby golf courses all while the kids take surf lessons, horseback riding or snorkel at the Rainbow Reef. There is even something for the littlest Mousketeers at Aunty's Beach House a well-equipped kids club designed for children 3-12. In the spacious club kids can meet Disney characters, enjoy Hawaiian themed arts and crafts, play dress up and even enjoy story time with Aunty herself, a lifelong resident of Oahu and a true expert on Hawaiian history. While in Hawaii every family should take part in an authentic Hawaiian Luau. It is hard to beat a Sunset Luau at Black Rock at the Sheraton Maui Resort and Spa. The Kaanapali Sunset Luau shares the music, dance and the sumptuous buffet of the islands right at the foot of the famous cliff diving point. While at the resort's famous beach make sure to stay for the nightly tradition of the Cliff Dive Ceremony, which can also be seen in comfort directly from the resort's Cliff Dive Bar. Staying at the resort is just as authentic and pleasing to the eye, almost all of the 500 plus rooms and suites have a lanai for enjoying the direct views of the Pacific Ocean. From the inside the décor is just as inviting, bamboo designed lamps shed light on wonderful tropical art that rests above rattan chairs all providing a unique atmosphere in which to relax and enjoy the island way. Family accommodations like the 665 square feet of the Ohana Suite are ideal for family separating the spacious living and dining areas from the sleeping quarters. The magic of the 1,660 square feet of the Alii Suite is its panoramic views of the Kaanapali coastline from the 180-degree wrap-around lanai. The entire suite and its dining room, kitchen and master bedroom are adorned with original works of art. Each and every family that visits the islands of Hawaii will see that Polynesian culture lives on through a multitude of reenactments, ceremonies, and traditions throughout the islands. Whether you are trying to learn to surf like Duke Kahanamoku, enjoying the menu of a traditional Hawaiian luau or taking a relaxing scenic tour of the natural wonders that surround you, you and your family will appreciate that Hawaii is like no other place on earth.